November 1st, 2018 | Organizing and Decorating. Renovating can allow you to return an older home to its former glory or personalize a plain home to suit your individual tastes. 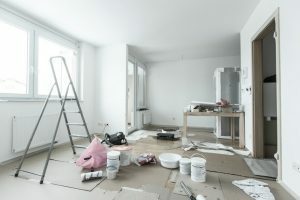 Many advocates of major renovations, such as home improvement shows, present remodeling as a process you can complete after you purchase a home but before you need to live there. However, for many homeowners, paying for two homes simultaneously isn’t an option, and in some cases, completing all renovations in one go may not be feasible either due to budgetary or time constraints. When you find yourself living in a home that you know needs intensive remodeling, the necessary tasks can suddenly seem daunting and overwhelming. In this blog post, we discuss what you can do as you move in and renovate to simplify this challenging endeavor. As you tour prospective properties and eventually invest in your next home, think about which home elements are most important to you. In addition to considering which aesthetic elements you care most about, think about which parts of the home you need to function best, like the kitchen or kids’ bathroom. Work with your spouse and any other adult family members to create a preliminary list of remodeling priorities. Be sure to factor in any structural or home system issues discovered in a home inspection. When you buy a new home, townhome, or condo, it’s vital to be completely realistic about what you can afford. When you know you want to renovate, your budget calculations must include any changes you want to make as well as your moving expenses estimate. In a conventional move, you would bring all of your belongings into your home as soon as you are able and begin unpacking as soon as you are ready. When you plan to start a renovation immediately following a move, however, you may want to keep some items elsewhere to reduce clutter and the risk of property damage. One of the best options for offsite moving storage is to find a moving company offering warehouse storage you can connect to any packing, loading, transportation, and unloading services you already plan on. In addition to keeping items off-site, you may want to consider keeping all nonessentials packed even if you intend to keep them on your property. Boxes can easily be stacked and organized in a garage, attic, basement, or shed, while extra belongings can get in the way. While you may consider your original priority list pretty final, if you plan to start your renovations while you live in your home, you should wait until you have lived on the property for awhile before you begin the project. Once you have had time to assess the actual living conditions, you may find you need to make urgent updates now and cosmetic changes later. For example, you may realize that a new HVAC system makes more sense than granite countertops. When you have an idea of which parts of your home will undergo the first wave of remodeling, think about where you will live during the process. Choose a home base as far from the construction as possible to minimize disruptions and debris. Think about ways you can make this zone work for your family. For example, you may need to establish a temporary kitchen or set up cots. Regardless of the scope of your renovations, you should plan to have days away from your home. Construction is often a loud, dusty process that can wear on your nerves and, potentially, even on your health. You may even be required to leave the site while certain projects like pest extermination occur. While you might feel like you can rough it as much as you need to in order to survive home renovations, you should also consider the needs of each of your family members. Some individuals should not be in construction areas full time. For example, young children may have trouble sleeping or keeping routines with the constant noise, and pets may become distressed or face injury in work zones. Decide how best to accommodate everyone’s needs. Many homeowners associate renovations with drawn-out processes and wasted money, and for good reasons. Intensive projects can get overwhelming and out of hand easily, especially if you try to handle them on your own. Vet and partner with a professional contractor to oversee some or all of your renovations. This choice can help keep the project on track and on budget. Use these guidelines, as well as the recommendations of your mover and contractor, to ensure that you can finish the renovations necessary to make your home a safe, welcoming, and beautiful place to live as efficiently as possible. For moving services to get you into your new home so you can begin the work of renovating and settling in, trust Wheaton World Wide Moving.